Just a quick note before we start this box. I probably won’t be shipping any of these cards out until next week. I’m sorting and counting as I write these up, so I need them around a tad longer. I’m shooting for next Monday for my ship date. Besides, you wouldn’t want to get them in hand before you see the videos and scans, would you? That would ruin the surprise! Okay, it wouldn’t actually ruin the surprise. It would make for a surprise. You know what I mean, anyway. Work with me, people! Moving on. Next we have a box designed after ID4. The future is now! 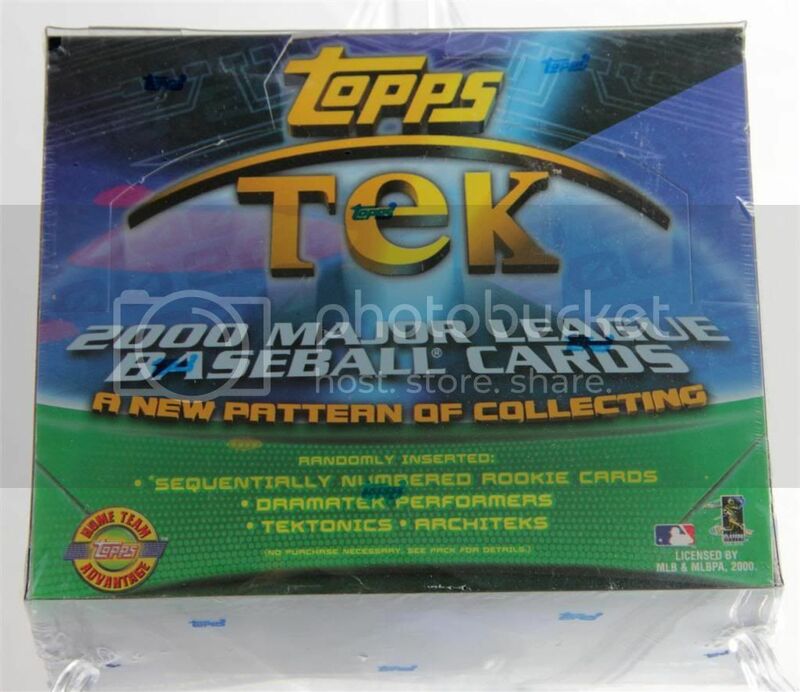 It’s TOPPS TEK! Please support our sponsor! For realsies! What a wacky product this stuff is. It’s basically the precursor to Moments & Milestones, which I featured in my pack lottery contest. People must have been buying it for a while, because it lasted a few years. 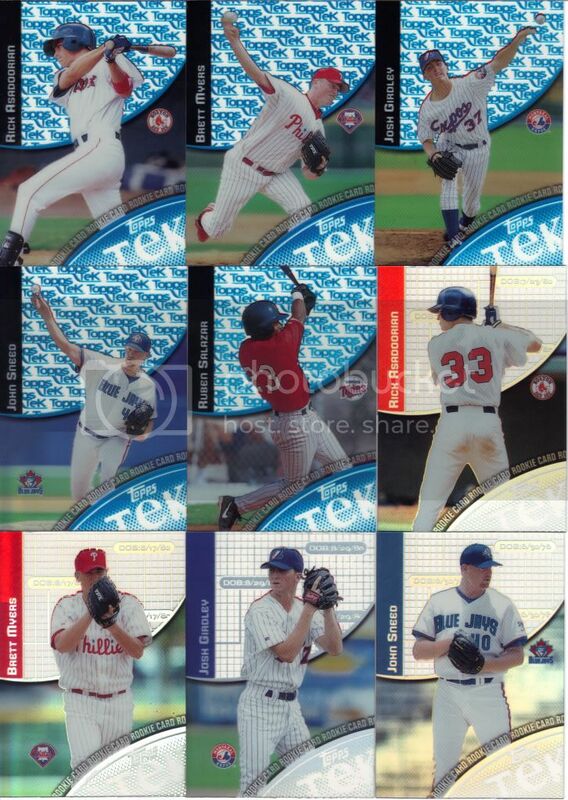 As evidenced by 2011 Topps, people love their parallels. Or at least Topps thinks they do. Man, I wish the focus was better. Next time I’ll try to use a different camera, or get an extra light to help things out. This looks terrible. You know what doesn’t look terrible? The scans of these cards. Not shown, 2 additional Ruben Salazars. Yay, unclaimed Twins! I noticed a pattern in this box (no pun intended). Most of the variations were for the same groupings of numbers. That’s why you see so many Topps Tek up there and so many DOBs (not to be confused with SOBs) in the second half of the scan. This theme spreads throughout. 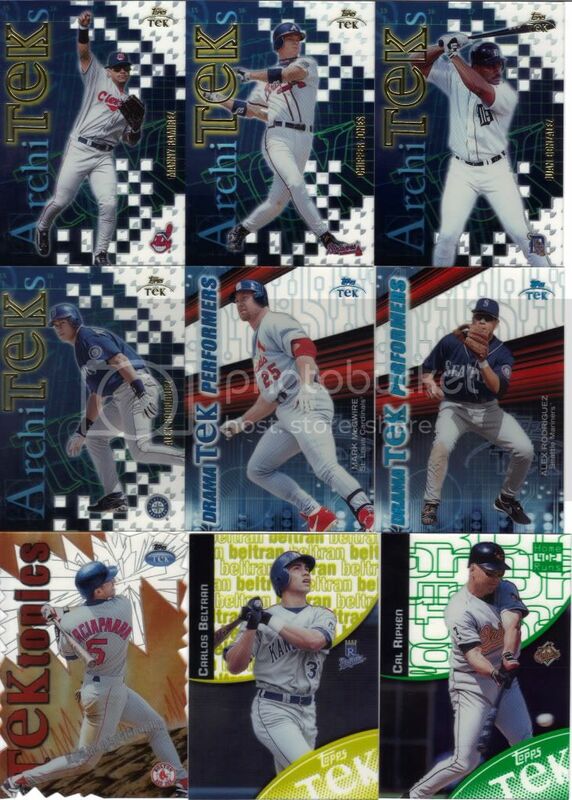 I completely missed the fact that Beltran in the first pack was our other color pattern. Oops. Why, yes. The Braves DID get another insert card. I know you were worried the streak would end. Luckily, this box provided a lot of inserts so the wealth finally gets spread around a little bit. #OccupyGroupBreak? Since every single card in this box is technically an insert or parallel, I’m bending the rules for the breakdown once again. All the numbered rookies will be counted as inserts. All the inserts are inserts (I would hope!). All 2 of the colored variations you see above are also in that count. All the base are the rest of the box. Yes, I meant to type it that way and no, the reference doesn’t work at all. That was a Mark McGwire/Juan Gonzalez/Arod hot box. I’ll trade for those two Josh Hamiltons when you’re through busting boxes. seems i used to pull a lot of juan gonzo back then also. Very cool! I don’t have any ArchiTEKs. Another Chipper!! Yeah! I love this Tek stuff. Wish the box prices were a littler cheaper. Glad to see this product included in the break.